It's hard to name a good reason to buy a budget DSLR now. You can get virtually all of the same features—lenses, image quality, manual controls—from a smaller, more portable mirrorless camera. So how does the Nikon D3200 fit into today's camera market? 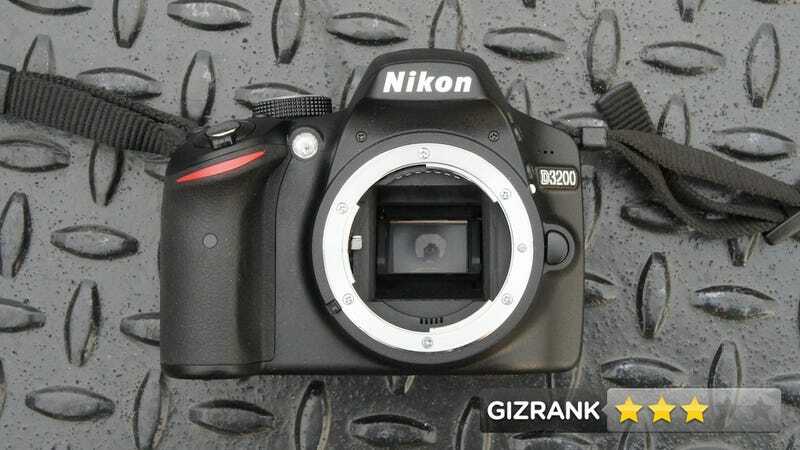 At $700, the Nikon D3200 is one of the most affordable DSLRs you can buy. Its 24-megapixel, APS-C sensor is much higher-resolution than the D3100's 14.2-megapixel guts. The D3200 also shoots Full HD 1920 x 1080 video, compared to the D3100's 720 x 1080 maximum. The D3200 is very compact and lightweight for a DSLR. It looks like the cameras that came before it in the Nikon line: A stripped-down body with basic buttons and dials, a pop-up flash, and a three-inch LCD which takes up most of the camera's back panel. If you want more than just a Facebook-worthy snapshot, get ready for a world of pain. Fully manual controls are available, and easy to access. It's a good thing, too, because the D3200's automatic light metering and white balance systems aren't dead accurate. You've got to fuss a bit to get you shots just right. The camera is capable of shooting a quick 5 FPS, but you'll be bogged down by the camera's slow autofocus. On the plus side, video recording quality and options have been significantly improved. If you're willing to work for it, the camera is capable of beautiful photos and video. Nikon hasn't updated the repulsive blue and yellow dashboard screen. Yes, it's that ugly. The inexplicably high-resolution, 24-megapixel sensor harkens back to the megapixel wars. • We used the Nikon D3200 regularly for about a month. • While higher resolution helps cameras like the 36-megapixel, pro-grade D800, it hurts the D3200's low-light performance. Getting a quality shot in a dark bar without flash is next to impossible. At high ISOs, images look like a glowing, noisy mess of horrible. • Despite being targeted at beginners, the D3200's weak automatic metering, autofocus, and white balance systems make the camera a chore to use. When walking around the city, we'd just as soon keep it our bag than struggle for a failed shot. • Compared to the D3100, the D3200 shoots sharper, distortion-free video that's actually usable as more than a gimmick. Yup, Nikon finally caught up with the two-year-old Canon EOS Rebel T2i. No. The cheapest mirrorless, interchangeable-lens cameras—including Sony's SLT-series cameras and the Sony NEX-F3—have gotten so good, it just doesn't make sense to spend extra on Nikon's name and lens system unless you're going to go for a higher-end model. It makes sense, to a certain extent, if you want to learn on this and keep moving up. If this had come out two years ago, it would have probably cost a couple hundred dollars more. Now, at $700, it's the first budget-friendly Nikon to shoot good HD video. But for the same price or a few bucks less, you can get the time-tested Canon T2i to do the same thing.